Whether it’s St. Patrick’s Day or any other day, here’s a little bit of green to start your morning. Our guest blogger, Erin over at Food Wise Family, has a creamy treat perfect for matcha lovers – it’s called Matcha Chia Pudding! Matcha is a finely ground powder of high-grade green tea. Unlike normal tea where you steep the leaves, with matcha you are consuming the whole leaf. Matcha has more caffeine than black tea, but less than coffee. Chia seeds are tiny seeds that retain a large amount of water. That’s why they are great in pudding, because they soak up all the delicious coconut milk in this recipe, creating a texture similar to tapioca pudding. Since they soak up at least 10x their weight, it’s best to eat chia seeds soaked, like in a pudding, so they don’t absorb the water in your body. These tiny seeds are a great source of fiber, protein, calcium, and omega-3s. Chia seeds tend to soak up whatever flavors you pair with them, so this matcha chia seed pudding is a balanced blend of creamy coconut and the refreshing earthy notes of matcha. While this matcha chia pudding is far from being Irish, this tasty little goody is a great alternative to enjoying a cup of matcha. I’m not giving up my morning coffee any time soon, but every once in a while I love to indulge in a cup of matcha. This vibrant green wonder is full of antioxidants and just the right amount of caffeine. With my love for coconut milk chia pudding, it was a no-brainer for me to combine it with matcha. This matcha chia pudding takes just minutes to prep and requires only four ingredients. Plus it’s dairy-free and paleo! Place remaining ingredients in the coconut milk and mix thoroughly. Spoon the matcha chia pudding into separate serving containers and cover. Refrigerate for at least an hour before enjoying. For the best flavor and for chia seeds to fully set, refrigerate several hours or overnight. *Use more or less sweetener to desired taste. **You can also use a regular blender, or even just whisk the matcha chia pudding. Just make sure to mix well. If whisking, make sure to mix it immediately after adding the chia seeds. Once the chia seeds get wet, they stick to everything and clump, so it’s best to mix it right away. I believe that the food we put on the table should not only be healthy, but easy and full of flavor. Check out my website foodwisefamily.com for more wholesome recipes. Our monthly guest blogger, Erin from Food Wise Family, is sharing the perfect holiday treat that will be the star of your next holiday party. If you are looking for a last-minute, homemade goodie to take to a holiday party or for a Christmas cookie swap, look no further. These no-bake chocolate coconut balls are simple to make, deliciously chocolatey and crunchy, and secretly healthy. During the holidays, it’s so easy to load up on sugary treats because they are everywhere. A great solution for this is to make sweets that utilize something that’s already naturally sweet. While these chocolate coconut balls are addicting and indulge your chocolate craving, they are also guilt-free because they are sweetened only with dates. No added refined sugars here…just pure, natural dates! This recipe is also paleo, vegan, gluten-free, dairy-free, and egg-free, making these chocolate coconut balls a great choice for anyone with special dietary needs or certain food allergies. Packed with protein from the almonds, these little chocolate coconut balls are also more satisfying than you think, making it easy to stop at only eating one or two. 1. Add dates to food processor and pulse several times until they are roughly chopped. 2. Add the remaining ingredients, except for the shredded coconut topping, to the food processor and blend until mixed well. 3. Using a spoon, scoop out enough mixture to easily roll into a small ball using your hands. Continue until you’ve rolled all the mixture. 4. In a small bowl, place the remaining shredded coconut and gently roll each chocolate ball to evenly coat with the coconut. 5. Place balls on a parchment lined plate, tray or baking sheet, and chill in the refrigerator for 15 minutes. 6. Store in an airtight container in the refrigerator and serve chilled. Claire is back and she brought Strawberry Rhubarb Pie! Claire has never let us down in regards to summer delights, and this is the perfect dessert as we transition into the hot summer months. Let’s all take advantage of the farmers’ markets and roadside stands this weekend to pick up some fresh fruit and see what treats we can come up with. In the meantime, Claire has pie to share. A little birdie has told me that it’s dessert week at Butcher Block Co. I know for a lot of people, that might conjure images of chocolates or cakes, but my favorite desserts are all fruit-based. Baked fruit, fresh fruit, whatever, I love it. We’re coming into fruit season now, and I can tell because giant, weathered rainbow umbrellas are popping up along roadsides over tables offering the best local summer produce at the best prices. We’re not quite at stone fruit season, but I am here for the early summer offerings, like strawberries and rhubarb. I love rhubarb, but like so many of the best foods, I didn’t appreciate it in my youth. I thought it was too tart, and also, it was a weird food that no one ever heard of and it looked like weird celery. When I was a kid, my mom would make rhubarb pie, and I would eat the crust and the ice cream and leave the filling. I was an idiot with bad taste; I always ordered the chicken sandwich in restaurants, which is why I didn’t discover how good hamburgers could be until I was well into my adulthood. But I digress. When I was a teen, my dad actually planted some rhubarb in our front yard. I watched it grow from a little puff of leaves on slender pink stems into a giant, fan-leaved monster that threatened to take over the whole garden. By that time, like all teens, I still hadn’t completely grown out of my idiocy, but at least I had better taste. I started making a mess in the kitchen trying to copy my mom and grandma’s pies. I did apples in the fall, peach in late summer, and as the spring would start to turn hot, I did my part to rescue the garden from the encroaching rhubarb-pocalypse. Of course, as an obnoxious teen, I couldn’t stick to their tried-and true recipes. Instead, I stole all the newly-ripened strawberries from the tiny patch at the side of the house and put them into a pie with the rhubarb. It turned out awesome. It was like a revelation. My family never really came around to my side – old habits die hard, I guess. For me, strawberry rhubarb pie is my absolute number one pie pick. I don’t make a ton of pies anymore. It’s less fun when the mess is in my own kitchen and I can’t rely on my dad to come in behind me and start doing dishes. Also, I am a grown adult person, and I can’t just go around eating pies all the time. Still, when I see those umbrellas pop up along the roadsides, I know I have to do at least one strawberry rhubarb pie to bring me back to those flour-coated summer days in the kitchen, my dad buzzing around me with a sponge and the whole house smelling like heaven. Heading home from the grocery store last weekend, I saw one of those rainbow umbrellas, and I had to stop. 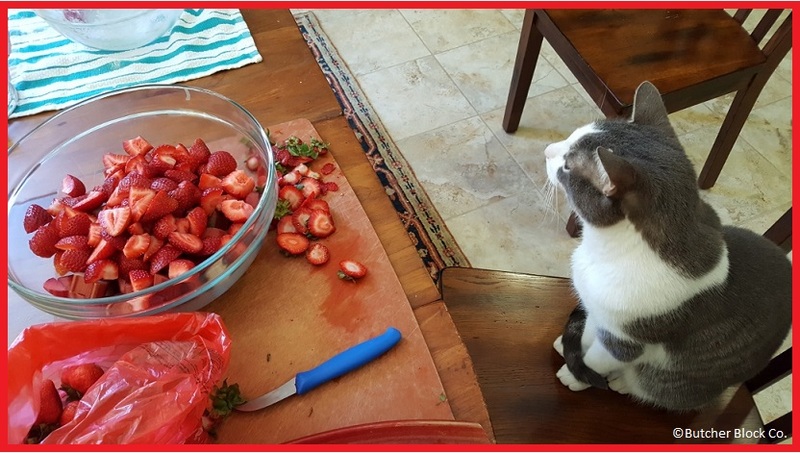 Fifteen minutes later, I was at the kitchen table hulling the sweetest strawberries, the whole house already smelling like heaven. 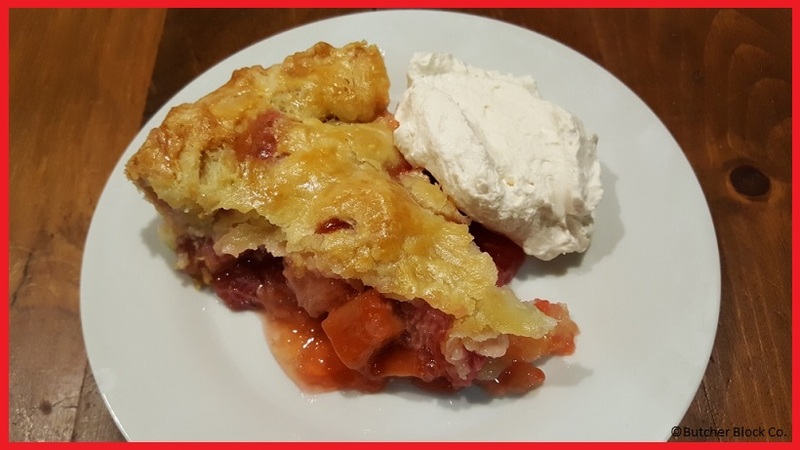 I don’t have my grandma’s recipe on hand anymore, so for this strawberry rhubarb pie, I used Deb Perelman’s recipe from the Smitten Kitchen, which of course turned out amazing, even though I over-cooked the filling a smidge in order to get a prettier color in the crust. I really like the way the tapioca thickened the juices without affecting the flavor at all. Then I figured, as long as I was committing sacrilege by deviating from my family’s recipe for the filling, I might as well go whole hog. Mom, you may want to stop reading here. for every pie with just flour, salt, vegetable shortening, and a little hot water to bind it all together. It’s a great workhorse crust. It doesn’t have a ton of flavor, but it’s reliable and simple to make, it works for a savory or sweet filling, and it’s what I grew up with, so it has always been my go-to. However, my mantra in the kitchen and in life is that the worst reason to do a thing is “because that’s how my parents always did it.” Plus, maybe I still have some of that obnoxious, rebellious teen in me. I decided to try my hand at an all butter crust for a change, and I am telling you, my eyes have been opened. It was flaky, rich, and as much the star of the dish as the incredible filling. After a perfect pie like this, I don’t think I could ever go back to shortening. Sorry not sorry, Grandma. In the spirit of dessert week, my husband and I have devoured nearly the entire glorious pie in the space of five days. I top each serving with some gently sweetened whipped cream, and I shamelessly lick the plate clean. What are you doing for dessert week? What is your quintessential summer dessert? 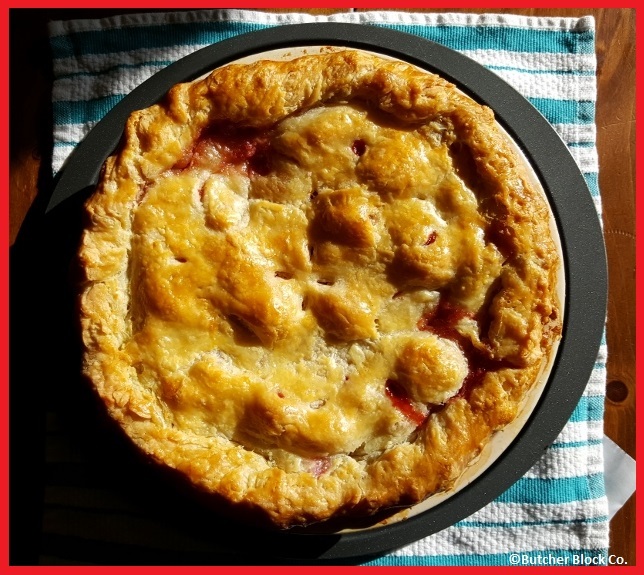 Is it weird that I’m strongly considering making another strawberry rhubarb pie this weekend? Need some simple, yummy Christmas cookies to make for your holiday cookie exchange? Or just to have on hand because, well, Christmas cookies are delicious? 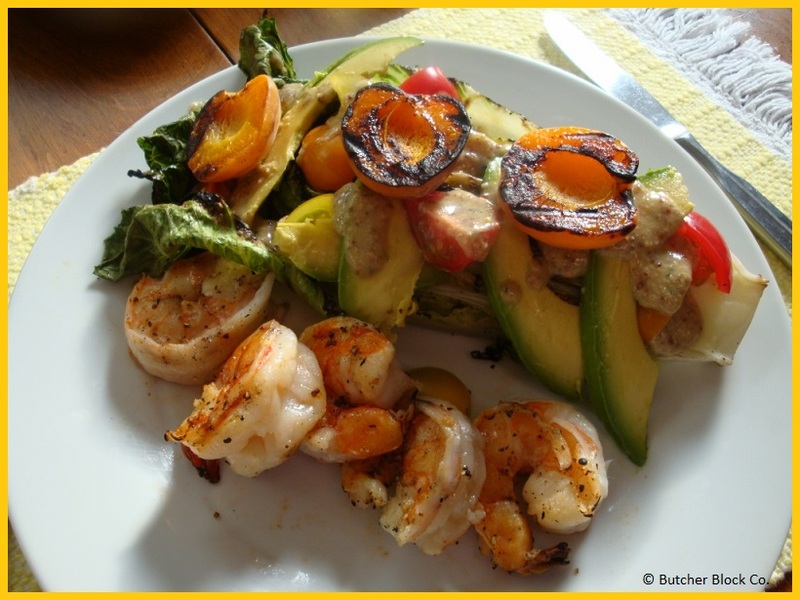 Sarah has an easy, tasty recipe to share with us today that will surely please a crowd. In my experience, there are two kinds of people who bake. People who love to bake, and people who wish it wasn’t quite so… involved. The holiday season brings with it the anticipated (or dreaded) holiday parties and cookie exchanges. I, for one love any chance to be a little extra festive and fancy (and enjoy a few cocktails, clearly), but I also want an “easy” button. Today’s recipe—Cherry Cordial Cream Cheese Cookies—is a little less involved than other Christmas cookies I’ve made, and the end result tastes great! This recipe was a challenge for me, because I love to tweak things I already know, and I knew this recipe was good using lemon juice and lemon zest. I also had a dark red cherry liqueur on-hand. And it’s the Christmas season… I really wanted these to be pink cookies with green lime zest on top, but we don’t always get everything we want from Santa, either. The cherry flavor from the cherry liqueur is much more subtle than you think it will be in the finished product, and the dough soaks it right up, so feel free to use a heavy hand. -Cream the butter, cream cheese, and sugar together. This will be a crumbly mixture with a clump of butter and cream cheese stuck to your mixer paddle. Don’t panic. -Add the egg. Hooray for egg! This will give you something more akin to a standard cookie’s wet ingredient mixture. -Add the cornstarch, baking soda, and salt. -Add the flour and cherry liqueur alternately. Mix half a cup of flour into your wet mixture and turn your mixer on for a moment to combine. This will get crumbly. Stop your mixer and add 2 tablespoons of cherry liqueur, then turn your mixer back on to combine. Repeat until you’ve added 2 ½ cups of flour and then balanced it out with cherry liqueur. -This is an opportunity to either chill your dough, or the start of the period of time where you need to work quickly. Use your hands to form balls of dough about ½ an inch to 1 inch in size (I am terrible at uniform cookie sizes), and space about an inch apart on a greased cookie sheet. I am a big fan of shortcuts in the kitchen, but my best tip today is to use the biggest baking sheet that will fit in your oven, so you’ll be making fewer batches of these bad boys. -Bake 8-10 minutes at 350°. These cookies beg for some sugar, and maybe some citrus, so you have two (easy!) options to finish them. The first is to top them with powdered sugar and lemon or lime zest. This takes seconds, looks nice, and adds a hit of sweetness. I used my zester to sift the powdered sugar, since I don’t own a sieve. Scoop a small spoonful onto the backside of your zester, holding it horizontally over your cookies. Tap the side of the zester lightly and voilà! Rinse your zester and grate some lemon (or lime—green for Christmas!) zest on top. Your second option is to make a glaze. This is going to require some time to dry, and may make transporting the finished product more difficult. However, a glaze adds a massive hit of sugar, which is beneficial to a more muffin-y cookie. Mix half a tablespoon of milk with half a tablespoon of your flavoring of choice—lemon juice or cherry liqueur are good choices in this instance. Add confectioner’s sugar bit by bit until you have a dippable consistency (about ¾ of a cup). Dunk the tops of your (cooled!) cookies in the glaze and let dry on a rack or plate before storing (or snacking—or not, I can’t tell you how to live your best life!). These Christmas cookies are not pink. They are not super sweet. They do not punch you in the face with bold cherry flavor. But they do have a very moist, dense consistency thanks to the cream cheese. And with a glaze or dusting of powdered sugar on top, they are a perfectly balanced bite that you and your cookie exchange participants will enjoy sharing while celebrating the holidays. Happy everything to you and yours! My only encounters with baked apples have been on camping trips, when we would wrap stuffed apples in foil and throw them in the fire. While delicious, they were quite messy…and there was no ice cream, so really what’s the point? I like Claire’s approach better, as it involves staying indoors and using real plates. And these baked apples just look SO GOOD! They are the perfect way to ease into Fall baking. Let’s get to it. Claire, usher us into Autumn with your spectacular baked apples! Well, it’s eighty-three degrees in the shade today, and California is still on fire, but I am ninety-three percent sure that I felt a cool, cool, autumn breeze last week, so I am already gearing up for fall. I am packing up my summer wardrobe, planning my Halloween costume, and breaking out the knitting needles for sweater season. Just joking; this is California. I just wear all dresses all year. I also plan my Halloween costume and knit year-round, obviously. I’m not joking about the breeze, though. I have lived here long enough to know that one cool week means nothing, except that we’re about to have another month of dry, relentless heat. In fact, in my experience, the first week of October has a habit of being the most unbearably hot week all year. All that aside, I am ready for fall, whether Mother Nature likes it or not. Across our great nation, Trader Joe’s and Starbucks are ushering in the autumn with pumpkin spice everything, but for my money, the most supreme fall fruit is still the apple. Whether pressed into cider or baked into pie, the combination of apple and cinnamon is distinctly, undeniably autumnal. Now, my grandmother taught me well and I make a damn good pie crust. Still, sometimes I find myself in a bit of a time crunch and have to turn out something delicious and impressive in a third the time of a pie. In a case like that, I will choose to forego the rolling and chilling and latticework and egg wash and skip right to the bake. 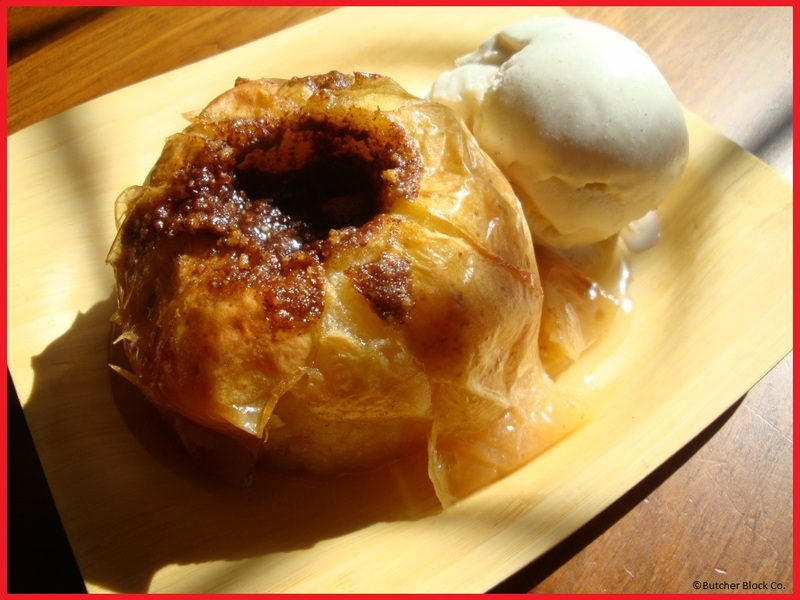 This very hot autumn, my go-to dessert is baked apples and vanilla ice cream. Preheat your oven to 375°. Using a sharp paring knife and a spoon, hollow out the cores of the apples, leaving just enough at the bottom to form a basin. In a medium bowl, mix together the rest of your ingredients. Fill each apple to the top with the spice mixture and place them in a baking dish. Pour half a cup of water into the bottom of the baking dish and bake for one hour until the apples are soft. Let the baked apples cool slightly. With a slotted spoon, gently lift each one into its own bowl or plate and top it with a nice big scoop of vanilla ice cream. These evoke all the comforting warmth of an apple pie without the fuss of the crust, and, as a bonus, they will make your home smell like heaven. For as simple as these treats are to make, they really make a stunning dessert, and a quintessentially autumnal crowd-pleaser. It’s been a while since I blogged a recipe to our readers. Thankfully we have Claire and Sarah to do most of the food blogs for us, because they LOVE to cook. I, however, really don’t love cooking or baking. I’m not sure why. Maybe because as a kid about 12 years old, it was my job to make dinner! We were given a day of the week, and it was our responsibility to plan and prepare the meal for the family. My divorced mom had 5 kids living at home at the time (seven kids total), so it was a very smart, strategic move on her part. While I was proud of what I learned to make…lasagna, meatloaf, spaghetti…I always felt like it was a chore. But luckily, I married a guy who is simply fabulous in the kitchen! He does nearly all of the cooking, AND he has taught me how to simplify recipes, and to enjoy the process as much as the end result. So once again, he has helped me come up with a recipe idea for our Butcher Block Co. Blog! For our walnut-themed week, I’m making easy, delicious Walnut Banana Bread! It’s timed perfectly for you foodies out there, because Saturday is also National Banana Lovers Day! So what makes this recipe easy? Buy Trader Joe’s boxed Banana Bread Mix and a bag of Walnut halves. What makes this recipe unique? Roast the walnuts, use frozen bananas, add vanilla, orange and almond extract, and add chocolate chips (of course)! Slightly roast the walnut halves in a dry fry pan on medium to high heat. Walnuts are done when they just begin to darken slightly AND you get a waft of nutty, earthy smell off of them. This should take no more than 10 minutes. Do not let them burn. Roasting will take the bitterness out of the walnut. Then chop them to the desired size. I used my handy John Boos Herb Board and Mezzaluna Knife for this. Yah! Follow the directions on the banana bread box. Whisk wet ingredients together then add the dry mix to the wet and blend with a spoon until just mixed. Now for the frozen bananas. Living in Arizona, I find that bananas turn really fast, so we have a freezer full of brown bananas at all times. Just toss them in the freezer, peels and all, and they are always on hand for baking and making shakes! So now, grab your frozen bananas and defrost them in the microwave just until soft. Squeeze the banana out of the peel into a bowl and mash them slightly with a fork. Add them to the mixture. Add chocolate chips and your chopped, roasted walnuts and fold together. Pour into lightly greased bread pan and bake at 350 degrees for *50 minutes (instead of the recommended 40 minutes). There’s still a little time left for some summer fun! We’ve been compiling recipes and ideas for a few years now, and we figure it’s the perfect time to share the summer fun with you. Adult or kid (or kid at heart! ), there’s something for everyone in this summer fun roundup! First and foremost, get a batch of Boozy Poptails in the freezer right away. These adults-only frozen pops will surely get you through the last few weeks of summer! If that booze gets you feeling nostalgic, come share your childhood summer fun memories with us here. Doing any camping this summer? Or attending a bonfire? Sarah’s fire pies are a definite must! Another fun way to eat outdoors is having a build-your-own kabob party! Everyone gets exactly what they want all grilled to perfection! If you’re looking for something on the lighter side, Claire’s grilled salad brings the best of summer onto your plate. Or if the heat is just too unbearable, stick with something delicious that you don’t even have to cook! Ceviche tacos make for the perfect dish on a hot day – no grill required! 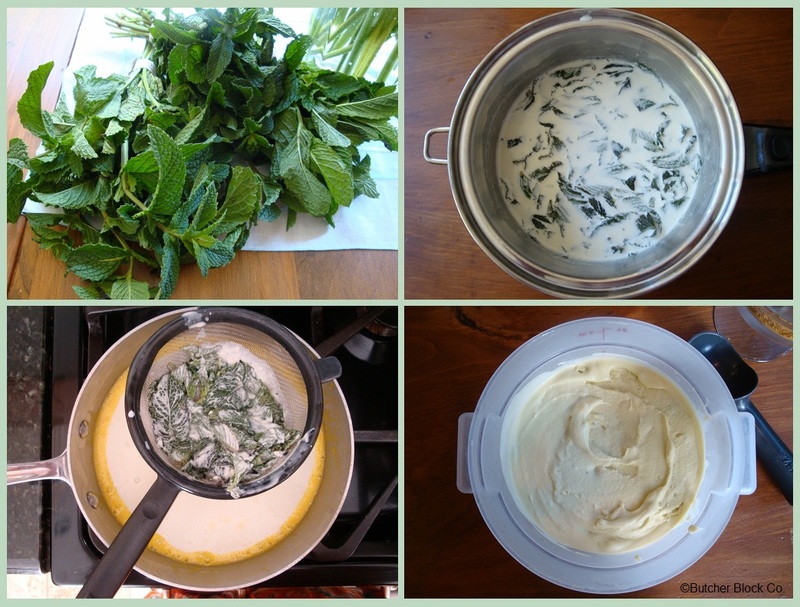 The very best way to finish off summer is with the most refreshingly delicious dessert: homemade mint ice cream. Can you think of anything better? I sure can’t! What are your go-to meals and activities for summer fun? Share with us! Poptails! If you don’t know what that means, Claire is here to explain, and save your face from melting this summer. I can’t believe this never occurred to me. After all, I enjoy booze quite a bit, and I really hate being hot. This is only natural. Let’s join Claire for some grownups-only frozen treats! Summer has officially begun. The temperatures are reaching record highs, and my air conditioning has been running at full tilt. I could go on about it, but frankly, even I am getting pretty sick of hearing myself talk about the weather. It’s time to accept the seasonal realities of my life here and just thank my lucky stars that I don’t live in Phoenix, where I hear it has reached nearly 120°F. In any case, even though it’s becoming increasingly hard to avoid talking about it, this post is not going to be entirely about the heat, as I have actual things going on in my life this week. Frozen pop cocktails. Or POPTAILS, because who doesn’t like a good portmanteau? A simple google search will yield dozens of recipes for alcoholic pops, and it can be fun to get a little fancy with it, but in my experience, a recipe isn’t always necessary. The rules to poptails are simple and few. 1) If it tastes great as a cocktail, chances are good that it will taste great as a poptail. 2) If you want a solid pop, your mix cannot exceed 20% alcohol. Not that a boozy slush treat isn’t also good, but it’s not quite the same experience. 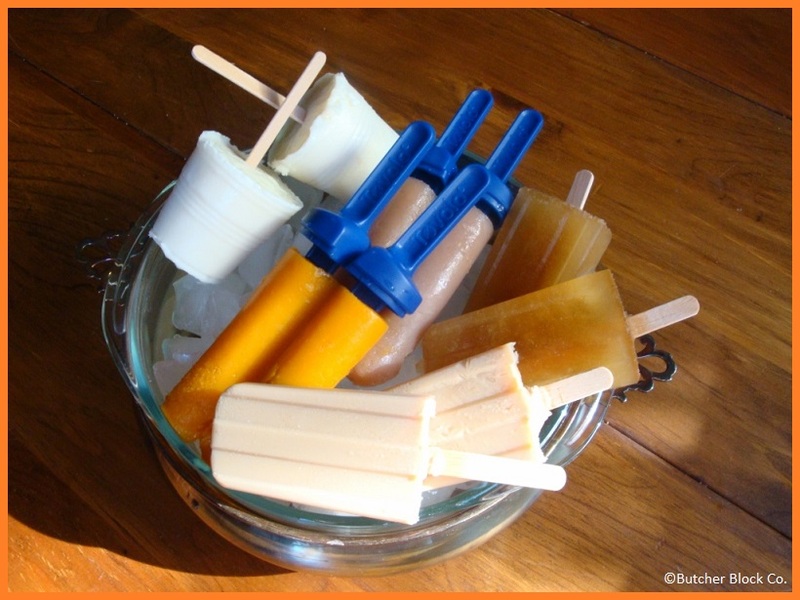 3) Frozen pop molds are also fun, but not always necessary. A disposable plastic cup actually makes a great mold, and all it takes is a little push on the bottom to free the poptails from the cups. With these rules in mind, I set out to the grocery store to find things that I thought would taste good with booze in them. I started with fancy-pants juices. Naked and Odwalla and Bolthouse Farms make nice, thick juices that are packed with fruit, so they have a lot of flavor. A little vodka or rum would be easily disguised under the richness of one of those, so I picked out a couple of options. Next, I picked up some sweet tea, because I know my man is a sucker for an Arnold Palmer, and I happen to have a bottle of homemade limoncello in my liquor cabinet. As I headed away from the juice aisle, I caught a whiff of the bulk coffee section, and my next poptail idea hit me. My favorite wake-up drink is coffee heavily spiked with Bailey’s Irish cream, so that was a no-brainer right there. Lastly, a couple of summers ago, I ran across this recipe for creamy margarita pops, and I’ve been dying to try them out ever since, so I grabbed a bag of limes and some plastic cups. 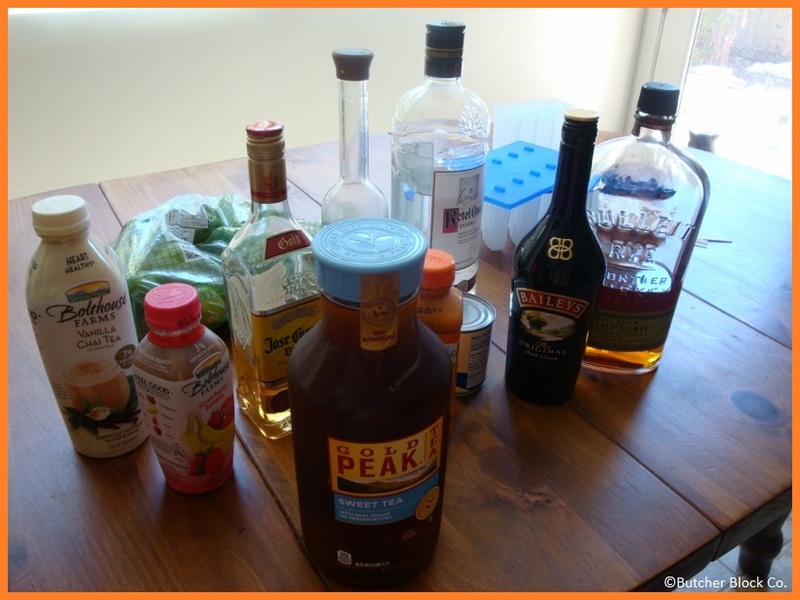 With the exception of the margarita poptails, I didn’t use any recipes, so I just measured out at least one cup of base beverage to one quarter cup of alcohol for each mixture. I ended up mixing strawberry banana juice with tequila, mango juice with vodka, coffee with Bailey’s, and sweet tea with limoncello. The two juice mixtures turned out ok, but next time I try those, I’ll dial the alcohol back a little further, because they did not freeze very well. Even after 24 hours in the freezer, they were still a little soft. The other two flavors froze perfectly, and Pier even texted me at work today to tell me how much he enjoyed the Arnold Palmer-pop. The margarita pops also turned out fabulous, and fully worth the time I spent juicing my 10 limes. These treats are super fun to come home to after work, and super fun to eat all day while you sit on the couch playing video games. Ten out of ten, would recommend. I’m already scanning the door of my fridge for more poptions. Pick Your Favorite Dessert Recipes From Our Dessert Cart! We have featured many amazing dessert recipes over the years, so in honor of Dessert Week at Butcher Block Co., we’re compiling some of our favorites in this Dessert Cart! From super simple to fancy, campfire-friendly to refreshingly cool, we’ve got you covered. So gather ’round our dessert cart, sample whatever looks tasty, and leave with a few new favorite dessert recipes to try at home! 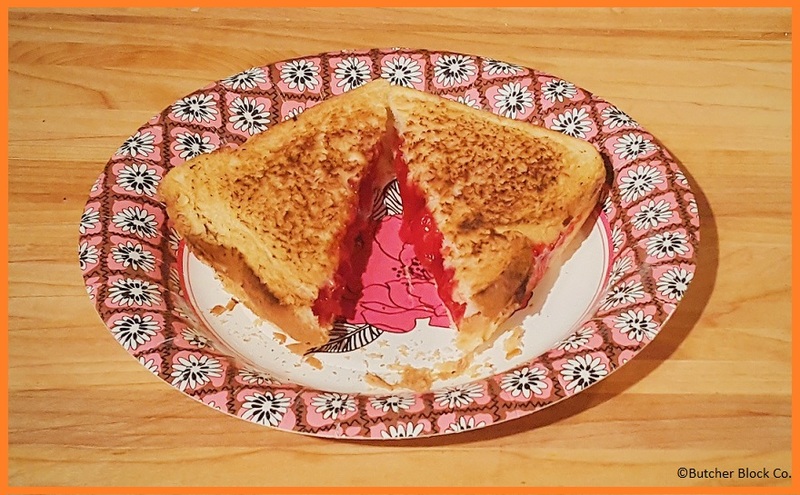 First up is from one of our most popular posts, which is understandable because it is AMAZING (I even made it myself last Father’s Day, and it turned out perfectly!). Claire’s Key Lime Pie is the stuff dreams are made of..just look at this! 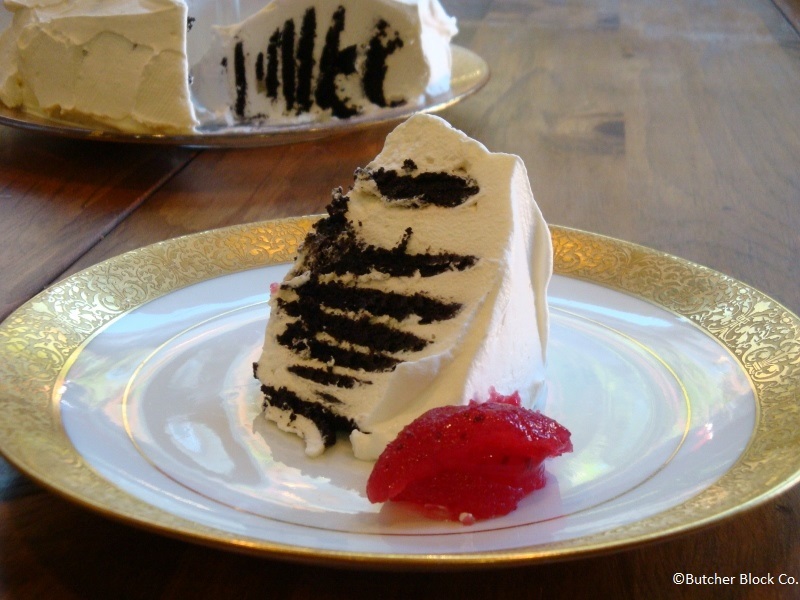 If you’re looking for something a little less labor intensive, this Icebox Cake is one of the easiest dessert recipes you can put together, and it turns out stunningly beautiful. No one will suspect the simplicity of this recipe! Speaking of easy, how about an ice cream recipe with only two base ingredients that doesn’t require an ice cream maker?! Alicia’s Easy Homemade Ice Cream fits the bill and will quickly become a summer staple in your family. Did that ice cream pique your interest? Looking for something a little more challenging? There is nothing that will cool you down in the summer better than mint ice cream. 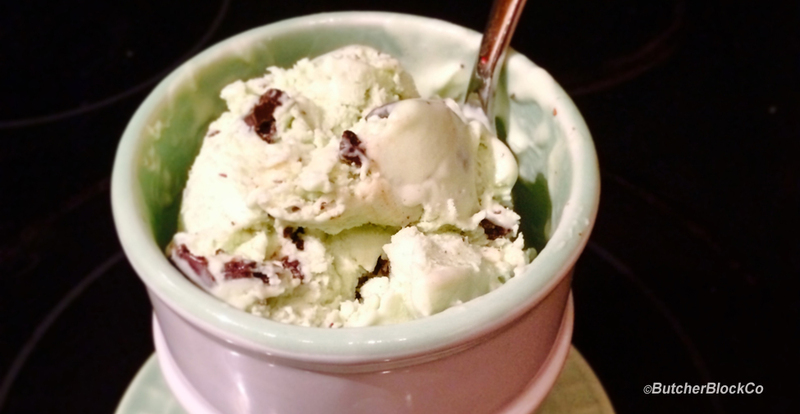 Claire’s Homemade Mint Ice Cream might take a little more skill in the kitchen, but it is well worth the extra effort. Refreshing mint and a buttery texture will make this one of your new favorite dessert recipes! Now, if you want to get out of the kitchen this summer, Sarah comes to the rescue with delicious and fun Campfire Pies! Your filling options are endless, so everyone in the family can customize their dessert to their own tastes. What are your favorite dessert recipes? Are you inspired to try something new this summer? Mint ice cream is probably the single most refreshing thing I can think of on a hot day. Since today happens to be one of those days, this post couldn’t have come at a better time! Honestly, though, is there ever a bad time for mint ice cream?? Claire is here to cool us off from the inside out with her fabulous homemade mint ice cream. Let’s get churning, Claire! My husband Pier has a serious sweet tooth. When we first met, I was trying to quit smoking. Seeing how hard I was struggling, he tried to give up candy out of solidarity, but he failed almost daily. A plate of cookies here, a bag of candy there, doughnuts for breakfast, ice cream for dinner. It’s lucky for him his job has him doing hard manual labor, or he would be as fat as I am. Cut to seven years later, and I’ve long since given up cigarettes, but he still can’t go a day without a good sugar buzz. Not that I’m exactly guilt free; I’m what you might call an enabler. I have replaced my nicotine cravings with a desperate need to watch people enjoy foods that I have created, so there is always something sweet around the house for Pier. That way, we can both get our fix. In the fall, it’s cookies and pies, and in the winter, sweet quick breads and cakes. It’s technically spring time now, and, I want desperately to be making shortcake and berry tarts, but I just can’t bring myself turn on the oven. Two weeks ago, I said that it was the perfect weather for grilling because it wasn’t too hot yet. One week ago, Mother Gaia read my post and decided to take it as a challenge. Suddenly, it’s summer three weeks early, and I am not into it. I suppose spring came early here, so it follows that summer would be hot on its tail, but I’m just not ready. With the California sun raining on my spring parade, I have eschewed all baked goods for a chillier option. I only want to eat cold foods that will make me cold and remind me of the good old days three weeks ago, back when I was cold. I officially declare this summer Ice Cream Season. Pier’s favorite flavor of ice cream is mint chip. I love mint too, but I think chocolate in mint ice cream detracts from the refreshing nature of the mint. Since it’s basically impossible to find mint ice cream without chocolate in it, and since homemade ice cream is about a million times better than grocery store ice cream, I have learned how to make my own mint ice cream. So, when I was in the grocery store last week seeking a brief respite from the heat, and I caught a whiff of fresh mint from clear on the other side of the produce department, I knew how I would be kicking off Ice Cream Season. Put the cream and milk in a heavy bottomed sauce pan and bring it just to a simmer. Watch it carefully so that it doesn’t scald. When bubbles start to come up, remove the pan from heat and add the mint leaves. Cover the pot and allow the mint to steep for two hours. In another saucepan, whisk the egg yolks and sugar over medium heat until they are fluffy and pale, and then strain the cream into the eggs mixture, using the back of a spoon to press on the mint leaves so all the cream and minty flavor gets into the pot. Whisk until fully combined, and then cook over medium heat, whisking frequently, until the custard reaches 170°F, or until a finger swiped across the back of a spoon leaves a clean line. Add the salt to taste. Pour the custard through a fine mesh sieve into a bowl or Tupperware, and cover it. Set the custard in an ice bath until it reaches a temperature of about 40°F, about 3 to 4 hours. If you’re not in a big hurry, you can also just set the container in the fridge to cool overnight. When the custard is fully cooled, pour it into an ice cream maker to churn according to the manufacturer’s instructions. When it’s done, pour the churned mint ice cream into an air tight container and set it in the freezer. Ideally, it should chill there for a full 4 hours before you try to serve it, but I can almost never wait that long. The texture is so creamy and buttery, and the mint flavor is so cooling and pleasant, I’m sure you’ll want to dive right in, too. 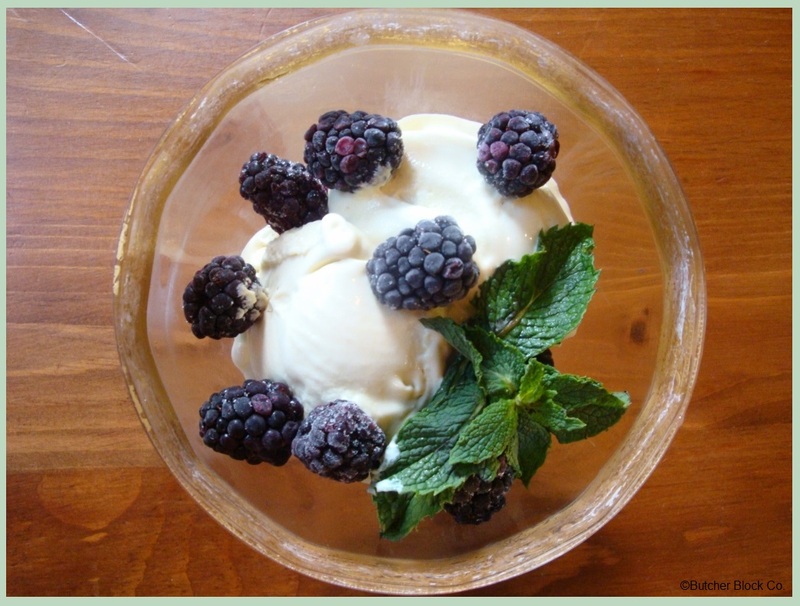 I also put some fresh blackberries in the freezer while my ice cream set, and they really worked well with the mint. Well, I know what I’m doing for the foreseeable future. What are your plans for the summer?